Today we added this bonus offer to our Shangri-La Golden Circle page but thought the offer is worthy of its own post on the Rewards Canada blog. The beauty of the offer is that you don't actually have to stay at the Shangri-La Vancouver to take advantage of it, you simply have to dine at MARKET by Jean-Georges. 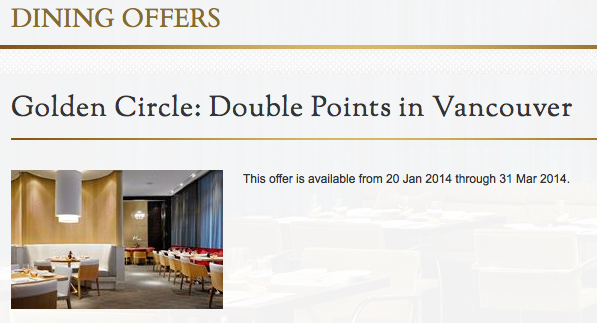 It was only as of the 1st of this year that Shangri-La Golden Circle started awarding points for dining at this YVR restaurant and in what looks to be a way to promote the new point earning opportunity they are offering double the points when you dine at MARKET by Jean-Georges until March 31st. If you have followed Rewards Canada for at least a few months you should have upward of 1,200 GC Award points in your account from the free points offer tied into Golden Circle's 3rd anniversary contest late last fall. Now if you are in the YVR area you can earn more points if you choose to dine at MARKET. Or you can 1,000 of those points to redeem for USD100 voucher to use towards your dine as well. Can't make use of this promotion? Be sure to visit our Golden Circle Bonus Points page for dozens of other bonuses!